Hello all! I doubt anyone will remember me as it has been years to where I had forgotten even my old log in name! I do believe this was the site I received so much help from. I again want to thank that when I had first started my rescue and hadn't a clue what a glider WAS a pair was dropped on my porch and I figured they were some type of flying squirrel until thorough research right off and much help from many here as they were malnourished, in a tiny parakeet cage and just... very badly off not to mention the female had joeys in her pouch. Later I've absorbed an unbelievable amount of knowledge on these amazing lovely creatures and feel maybe I too can make a contribution. I'd love to be able to help anyone anytime day or night if it's something I can offer help with, paying forward the kindness I myself was shown so many years ago. I was around 17 then, now will be 28 in July. 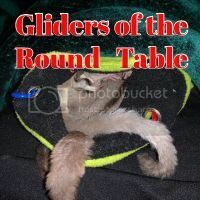 In Eastern NC (Especially being close to the horrid group that sells gliders in Myrtle Beach malls) often take in gliders on terrible diets who are quite sick and timid. Back in NC I can no longer have room (Also legality of RVS species) I can no longer rehab Raccoons, in an apartment it's almost a no brainer my fav rescues of large abused birds (When you win their trust and work with them to see them LOVE in time a potential adopter is just incredible from a plucked chicken fed birdseed to a great diet and fluff all over) BUT I can help the little fuzzies I adore so much. I do so wish I could save every one I get offered but taking on too many they would be in no better shape and not get attention and space to be re-homed eventually. I wish so much to be a breeder (Have been dumped with many who had joeys) but with the amount needing adoption and help in my area currently (Every few months it's like an epidemic) I personally cannot choose to breed intentionally over rescues, however HAVE been thinking of a Leu Het pair of my own as a furever home adopted as joeys, sisters maybe. But that would be planning for a commitment I'd know I could handle and never leave them wanting for anything, spoiled rotten. If anyone remembers me, THANK YOU AGAIN for the "These flying squirrels" on the porch that without your help would have been so lost with so much misinfo on the internet and EVEN PET STORES. Sadly. So I'm amazed at the dedication and love you all show and should you ever need help I can offer, contact me anytime and I can't wait to get to know you all! I have only been a glider slave long enough to learn, and I too was in need of help many times in the beginning. Like you, I got frustrated over what info was out there and found refuge here. I have also made many friends here too. I love these little furballs! And I want to help provide the best advise I can for others. There has been a new diet study done, and a lot of new information recently come to light. I look forward to seeing you on here and please feel free to ask, tell stories, and share experiences. Welcome back, I've only been a member here since 2012.